Just back from Orissa, having danced at the International Odissi Festival,2011. I came to know of my participation just ten days before the event, and it was a lot of quick planning to get dance practice, costume, air tickets, hotel bookings etc. all done in a jiffy. I danced 'Archana Puri', a special dance where a devadasi prays to Lord Jagannath in his temple in Puri. 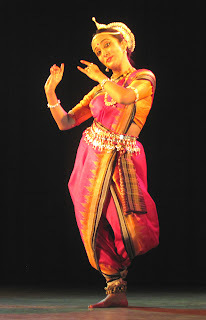 Having performed this dance I realised that this dance by Guru Surendra Nath Jena is not a dance but a prayer. It gives the dancer a special kind of satisfaction, elation and blessing and brings her so close to Jagannath ji. In fact this whole year of 2011, seemed like a series of planned events by Jagannath ji. I brought my family in January to Orissa to take blessings from him. And it gave me creative stimulus this year like I have never had before. I created new things and realised so many new things. He came to our house in the form of a beautiful Jagannath painting painted by an artist from Raghurajpur. In our Odissi classes we showered Jagannath ji with love,flowers, shashtang pranams and even learnt to make his face in a craft project. And then as the year drew to a close Jagannath ji invited me to Orissa again, to dance, experience him intensely in a very special dance Archana Puri. It was as if he wanted to let me know that we have found a very special love in each other and it will only multiply with time. I feel blessed.